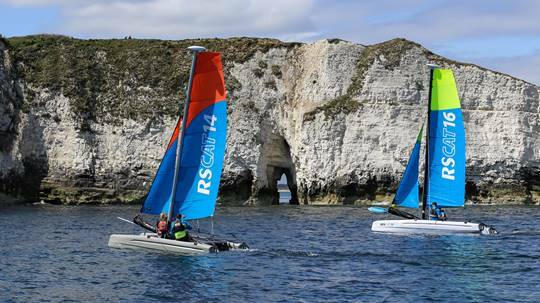 The RS Cat14 catamaran and it’s bigger sister the RS Cat16 take the enjoyment associated with sailing traditional beach-style catamarans to a whole new level. The durability and stiffness achieved through the use of Comptec PE3 roromoulded polyethylene hulls, coupled with the balanced feel of the steering when sailing make both of these world class sailboats perfect for not only recreational sailing, but also as additional equipment for sailing programs wishing to provide a more ‘performance’ oriented youth / adult training pathway. If your organisation uses sailing catamarans as part of its water-sports activity program and is interested in updating the current catamarans being used then why not consider the RS Cat14 or Cat16 when it comes to making your next purchase.Contact our International Business Development team directly for more information on either boat or to receive a detailed quotation based on your specific requirements. The RS Catamarans utilize a unique ‘design protected’ construction system for joining the cross-beams to the hulls, which provides increased stiffness to the overall sailing platform when compared to other plastic catamarans of a similar size. This system also provides the added bonus of allowing the boats to be disassembled far quicker than other similarly sized catamarans, for storage and transportation purposes. It also means that all of the mechanisms required for joining the hulls are externally mounted, with no access to the inside of the hulls required. Asymmetric Spinnaker / Gennaker and Trapeze). XL (Reef-able Mainsail, Jib, Asymmetric Spinnaker / Gennaker and single trapeze).